Feral pigs are the descendants of domestic pigs, which were first brought to Australia by early European colonists. 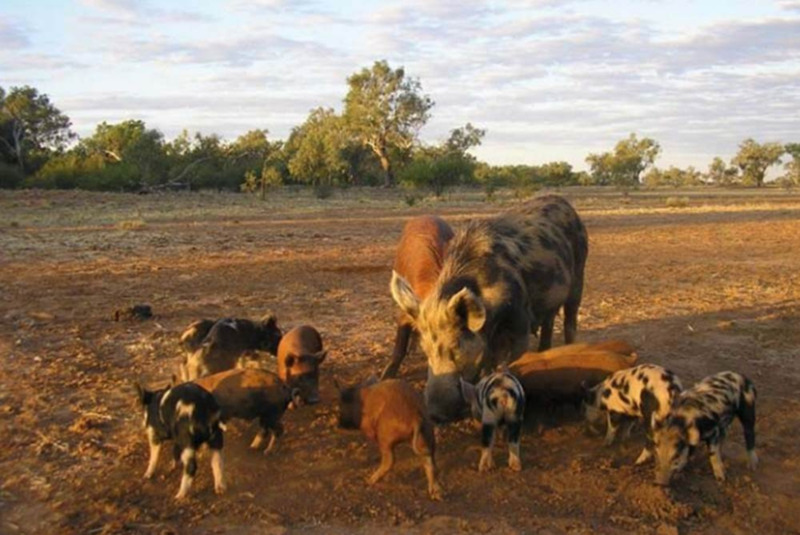 Feral pigs cause a range of agricultural and environmental damage in Western Australia, therefore control measures are important. Feral pigs (Sus scrofa) occur in around 40% of Australia, causing losses to agricultural production in excess of $100 million per year. Feral pigs have detrimental impacts on biodiversity and act as reservoirs and transmission agents for animal diseases. In Western Australia (WA), feral pigs are abundant in the Kimberly and are associated with the major drainage systems. Although widespread in the south-west of the state their distribution and abundance is patchy. Baiting using 1080 (sodium ﬂuoroacetate) is the most effective option for controlling feral pigs. Control using shooting and trapping can be carried out, but shooting only removes a small proportion and can disperse the pigs. Trapping is relatively labour-intensive and may not remove older and ‘wiser’ pigs. Many of Australia’s native wildlife have a natural tolerance to 1080, unlike introduced species. That is why 1080 is used for invasive species control. Watch this animation, produced by the Centre for Invasive Species Solutions, to learn more. In WA, feral pigs are declared pests under the Biosecurity and Agriculture Management Act 2007. Landholders are required to control feral pigs on their properties. Any control option used must be in accordance with the Animal Welfare Act 2002. It is illegal to ‘swill feed’ feral pigs for control or other purposes. It is also an offence to hold feral pigs in captivity without a permit. Feral pigs can be found in most areas with appropriate food, water, and shelter, like breakaways, remnant vegetation, swamps and riparian habitats. Feral pigs will travel greater than 20km in a single night to reach favoured areas. Consequently, it is important to have knowledge of feral pigs in your area to maximise successful baiting. Coordinated baiting programs with neighbours are more effective. Feral pigs often travel along tracks, creating pads similar to those of sheep and cattle. Evidence of feral pigs is usually most pronounced at the end of autumn and early winter when pigs travel further to find food. This is the best time to bait, provided that six to eight days of ﬁne weather are expected as 1080 is water-soluble and leaches from baits as a result of rain. Bait stations comprise two raked-earth plots each 1m² in size spaced 5m apart. Ensure a minimum 100m distance between each bait station. Cattle can be excluded with a temporary fence of barbed wire with the lowest wire about 65cm above the ground. Research trials in WA have shown that malted barley, wheat and plain barley are best used for feral pig control. Feral pigs display a mixed response to lupin bait and commercial pig pellets are ineffective. Fermented wheat used as an attractant for feral pigs is prepared by soaking wheat in equal parts water for at least 24h. A small handful of non-deodorised blood and bone placed with the fermented wheat acts as an attractant. 1080 concentrate products available to WA landholders for the control of feral pigs are listed in theinformation sheet: Rates of lay for 1080 / strichnine products. For information on how to access bait, poison and toxin (bait) products, training required, animal welfare considerations and legal requirements, see the Bait and poison directory for vertebrate pests in Western Australia link. Looksee-baiting is undertaken in areas showing recent evidence of pig activity (rooting, pads, faeces, feeding) to determine where to locate the bait stations. One or two 1m² raked-plots are established by placing 500g pile of fermented wheat with about 90g of blood and bone on each plot. A light, 5m trail of fermented wheat can be laid either side of the plots to help pigs find the grain. Record daily the amount of wheat taken and rake the plots to remove any tracks. Replenish the wheat to its original amount. Formal bait stations (two raked-plots spaced 5m apart) are only established at those plots where most of the fermented wheat is eaten during the looksee stage. Ensure you have several areas where this occurs so that you can establish two to six permanent bait stations at these locations. Once the formal bait stations are established, free-feeding is undertaken using about 500g fermented wheat and the blood and bone attractant, and 1kg of the bait material to be ultimately used to poison the pigs. Free-feeding should continue until there is good consumption of grain for three to four consecutive nights. Do not continue to free-feed for any longer than necessary, as pig behaviour may change and pigs leave the area. Poison-baiting should be undertaken after the consecutive nights of good free-feed take. Make sure you remove all residual wheat and the bait material before poison-baiting commences. Two, 1 or 2kg piles of 1080-treated bait are then added to each raked plot. Each station generally has 4 or 8kg of 1080-bait. A small amount of the fermented wheat and blood and bone is added as an attractant in the corner of each raked plot. If more than about 30 pigs are suspected to be present, do not increase the amount of 1080-bait per raked plot, instead add one or two additional 1m² raked-plots (maintain 5m spacing). This ensures all feral pigs have an opportunity to feed on toxic bait, and avoids any excessive feeding by individual pigs. Poison-baiting must continue for at least four to ﬁve consecutive days or until no further bait is eaten. The piles of poison bait at each station are made up to their original amounts each day. Keeping a record of bait station visits, from the tracks of pigs, birds and other animals, and the amount of bait eaten, is important as it helps to determine when baiting should cease. Usually, most pigs are killed in the ﬁrst two nights of poison-baiting, but leave the poison bait in place for at least four to ﬁve nights to ensure that all pigs in the area have been killed. Occasionally, there may be several mobs of pigs and some individuals may not return to the stations for a few days. There may be periods with no pig visits or feeding, followed by a period with reasonable take of poison bait. Poison-baiting should continue until you believe all pigs have been killed. If required, follow-up monitoring can be undertaken by removing all residual grain, then adding 500g piles of fermented wheat and blood and bone attractant to each plot to determine if any pigs remain. If this grain is consumed by pigs, remove any residual and re-poison as above. Follow-up monitoring is particularly important if the number of pigs is not well known and/or a number of different mobs are believed to be present. It can be difficult to estimate the number of pigs present but visual observations of rooting and other signs can help. The use of raked-earth plots are important as the age and numbers of the pigs can be estimated. When making estimates be aware that a small number of pigs can cause a lot of damage or rooting, so it is easy to over-estimate pig numbers. When unsure, it is better to add extra bait stations or raked plots. Four kilogram of 1080 bait can kill about 20 to 25 moderately-sized adult pigs, and the recommended baiting method regularly kills large (over 70kg) pigs. Research trials have shown there are few risks to non-target animals using the recommended baiting method. Birds and kangaroos will occasionally spread bait, but little is actually eaten. Foxes have been killed by eating 1080-treated grain meant for feral pigs. Residues of 1080 in the muscle of pigs poisoned with 1080 are too low to pose a risk to native animals. Irrespective of season, poisoned carcases readily degrade and become inedible within two to eight days. Introduced animals such as dogs, foxes and cats have higher sensitivity to 1080, and can be killed by feeding on carcases of poisoned pigs. Risks to native animals can be reduced by digging a shallow depression and lightly burying the poison bait, or by covering the bait with a few small sticks to restrict access by birds. Do not undertake either of these steps until the feral pigs are feeding freely at the bait stations. Because of the potential for increased degradation of 1080, do not bury bait in moist soil, and do not leave the buried bait available to pigs for more than 14 days. If there are concerns regarding the germination of grain in conservation areas (bush remnants), malted barley bait can be used as it is not fertile. Although pigs poisoned with 1080 are often found within 200m of a bait station, some pigs can travel more than 3km before they perish. This, together with the dense vegetation and rough terrain where many pigs reside, makes finding poisoned pigs difficult. Not seeing carcases does not mean your campaign has failed. The amount of bait taken and a decline in pig activity is the best indicator of success. Follow-up monitoring is a useful component of your baiting strategy. Who can receive, mix and use the bait? Use, purchase and sale of 1080 concentrates for feral pig control can only be done in accordance with the Code of practice for the safe use and management of 1080 in Western Australia. For further information on controlling feral pigs, contact the Pest and Disease Information Service.